The dolphin's brain is the second most powerful and complex brain in animals (next to the human brain, of course). Intelligence may be defined as a measure of the brain's ability to process information in ways that solve problems and enhance one's survival. Measuring intelligence may be quite different for animals that have evolved in water versus those living on land, as the challanges required to survive in water are quite different than those required on land. Much debate exists regarding dolphin “intelligence”. Dolphins have a large brain. Large brain animals like humans, chimpanzees, and dolphins have a number of things in common. They generally live long lives. They form stable communities. They live in fluid social groups. And they demonstrate total parental dependence during childhood. An appropriate IQ test to measure dolphin intelligence does not exist. It is impossible to fully assess this animal's level of intelligence in this manner. But another way which has been suggested to measure intelligence is by determining the measure of relative brain size defined as the ratio between actual brain mass and predicted brain mass for an animal of a given size. This is called the "encephalization quotient", or EQ. This measurement suggests the higher the number, the greater the intelligence. The human EQ is 7.0. The EQ for great apes, elephants, chimpanzees and whales is about 1.8-2.3, meaning they have smaller brains for their body size than do humans. The dolphin's EQ is 4.2, the closest EQ ratio to the human than any other animal. Additionally, the degree to which the cerebral cortex is folded appears to be a measure of intelligence. The more folded the cortex, the more room within the brain to house additional neurons (brain cells) with which to perform processing of information. Recently published information regarding the increased folding of Albert Einstein's cerebral cortex compared to that of other humans supports this theory. The only animal to have a more folded cortex than man is the dolphin. This picture is of the human brain. Some scientists believe the major reason for such a large brain is to process information from the dolphin's complex echolocation, or biosonar, system. But there is no evidence to support this belief. The theory most commonly accepted is that this larger brain evolved to support more complex cognitive abilities. They can remember events and learn concepts, changing their behavior as a result of previous experience. They can communicate with each other during cooperative behaviors, manage relationships in their pods and raise their young. They can understand not only symbolic (sign) language words but can interpret the syntax (word) order of language. This understanding of syntax is highly indicative of intelligence. Signature whistles produced by dolphins (see the "vocalization" chapter of this website) serve to offer some evidence that dolphins have a self-awareness, or the capacity to have a concept of "self" and to know that one exists as an individual being. Self-awareness exists in the brain's pre-frontal cortex. Other than in dolphins, self-awareness appears to exist only in large brained primates and man. As a result of the study of Alzheimer's disease in man, human spindle neurons (specialized nerve cells in the brain) have been found to be associated with the ability to recognize, remember, reason, communicate, perceive, adapt to change, problem solve and understand. Autopsies of deceased Alzheimer patients' brains show a high frequency of deteriorated spindle neurons. Recently spindle neurons have been isolated in the brains of the true (baleen) whales. This finding suggests true whales possess these advanced abilities which, in the past were only associated with man and primates. It has long been suspected that dolphins have the ability to recognize individuals and objects, remember tasks, problem solve, adapt to change and learn complex tasks. Research done at the Department of Neuroscience at Mount Sinai Medical School (C. Butti, et.al., J Comp Neurol 515 , 243-59, 2009) proves spindle cells are present in the dolphin brain, as well, giving credence to these suspicions. 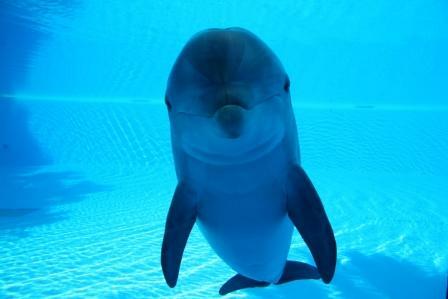 Dolphins have been shown to recognize themselves in a mirror, using what is called "contingency testing", or making movements while examining themselves for this movement. This finding is unexpected as dolphins primarily experience the world through sound and their echolocation system would not function in a 2-dimensional (mirror) reflection. They are aware of their own recent behaviors and can repeat a behavior or, when asked by a trainer, perform a behavior which has not been performed recently. Commands representing "repeat" or commands representing "any" result in the repeating of a recent behavior or choosing any non-recent behavior, respectively. This shows the ability of a dolphin to maintain a mental image of the behavior it last performed and update that image as each new behavior is performed, repeating the latest behavior in this sequence when requested. Dolphins respond to a trainer pointing to an object. Not only do dolphins understand and respond appropriately to a human pointing directly at an object, they respond appropriately to a cross-body point (placing ones arm across the body pointing to the object). An example of an appropriate response to pointing would be to retrieve an object to which the trainer points or to move an object from point "A" to point "B". The ability of military personnel to watch a radar screen for hours on end without losing concentration was studied during World War II. A similar study of the dolphin's ability to remain focused on tasks requiring protracted concentration has yielded interesting results. Using a program that flashes 60 images and sounds for 1 second each separated by one-half second intervals, dolphins were able to stay focused on the task of identifying the critical image or sound between 95-100% of the time. This demonstrates the dolphin's ability to remain attentive for long periods and to make rapid discriminations between critical and non-critical images and sounds with a high degree of accuracy. Besides being aware of themselves, dolphins experience basic emotions, engage themselves in some degree of abstract, conceptual thought, choose their actions, learn by observing, understand the structure of their environment, learn what works and what doesn't by solving problems. and create new solutions to problems with which they are presented. When interacting with man, they appear to recognize the difference between children and adults and tend to be more gentle and patient with children.